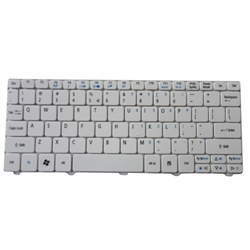 Description: New Acer white netbook keyboard. This keyboard is the US version. Part #'s: KB.I100A.114, MP-09H23U4-6986, NSK-AS61D, 9Z.N3K82.61D, PK130D34B00. Acer Aspire One D257, D270, Happy, Happy 2.